To reach GHG emission reduction targets, the passenger vehicle sector would need to reduce miles traveled by 15 percent in addition to other state and local measures like increasing fuel efficiency and using cleaner fuels. Image from ARB, Proposed Update to the SB 375 Greenhouse Gas Emission Reduction Targets. The Air Resources Board (ARB) just released its proposed update to the S.B. 375 targets, which tell each region how much of the state’s GHG reductions they are responsible for. California has set a high bar for GHG reductions statewide: last year’s S.B. 32 set the statewide targets at forty percent below 1990 levels by 2030. Each region is responsible for coming up with strategies for reaching its targets. The proposed targets will be presented and discussed at three upcoming workshops—in Bakersfield tomorrow, in L.A. on Wednesday, and in San Francisco next Wednesday, June 29. Details can be found here. Some means of reducing emissions, like encouraging clean fuels, are state responsibilities, but each region, under the guidance of its Metropolitan Planning Organization (MPO), is responsible for a share of the state’s total GHG reductions. Since transportation is the largest single contributor to GHG emissions in California, a large part of achieving reduction targets involves finding ways to make it easy for people to drive less. The goal of S.B. 375 was to get regions to acknowledge that development patterns greatly affect transportation choices, and that planning for the two must be coordinated. But while the majority of MPOs control much of the available transportation funding, they have very little control over where housing and jobs are developed—local control has always been a strongly held tenet of land use planning. This requires the MPOs to coordinate with local jurisdictions to develop plans that are consistent with both local and state goals. Some regions have approved their first set of strategies, called Sustainable Communities Strategies (SCS), and some regions are on their third update. ARB has determined that every region’s strategies are enough to achieve its targets up to 2020. But after 2020 the state climate goals will become much more stringent, and therefore harder to reach. This spring the ARB held a series of workshops to talk about new regional targets, and in keeping with its past practices, has allowed MPOs to have a large say in what their targets should be. MPOs did the analyses, compared alternative scenarios, and laid out challenges they faced. At those workshops —and in their own target recommendations—the MPOs shared a number of reasons why they believe “reasonable” targets should be set. Regions shared two major obstacles preventing them from achieving higher targets: lack of funding and increases in driving due to factors beyond their control. At the same time, advocates pointed out that setting low, easy-to-reach targets would be a meaningless exercise, and do little to move the state towards its climate goals. The MPOs have said that they are stymied by what they call the “rebound effect.” That is, they say that as driving becomes less expensive because vehicles are more fuel efficient—a good outcome of state efforts—people will drive more. The MPOs also say that they don’t have enough money to invest in sustainable transportation options that would help reach the targets, and that what funding they do have is limited to certain types of expenses. That prevents them from being creative about investing them in ways that would most effectively help reduce GHGs, like maintaining and expanding transit or increasing walking and bicycling infrastructure. 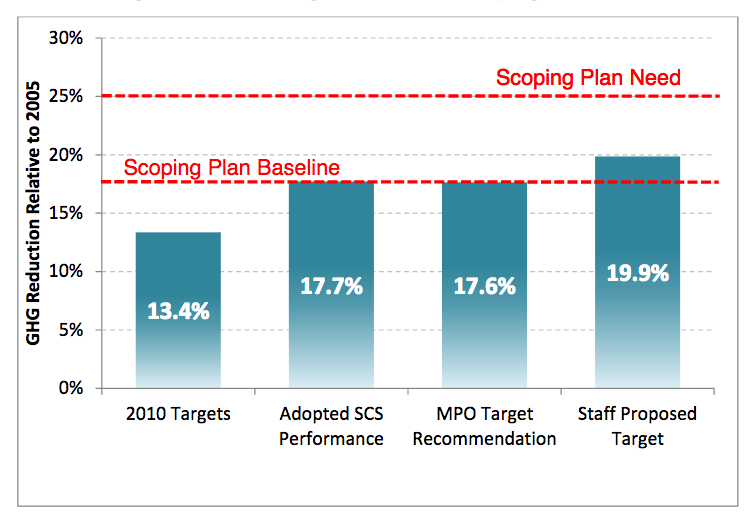 But this chart from the ARB’s report shows how far that is from reaching overall targets. ClimatePlan is a network of organizations pushing for stronger targets. The process of target-setting lays the groundwork for many other tasks, including allocating funding, so it’s important to get it right from the beginning. “With ambitious targets, the state can do more, not just for the climate, but for Californians’ everyday lives,” wrote ClimatePlan. Climate Plan has done extensive research on the results of S.B. 375—some of the only research that has been done on whether all this planning work has had its desired effect. In general, they found that results have been generally weaker than they could be, and that the lack of data makes it very difficult to measure and understand the cumulative effect of these efforts. That’s because it is all connected. For example, although MPOs are right when they say they have limited funding, they are about to get a lot of money from S.B. 1—and the question is, will they spend it in a way that furthers GHG reduction goals, or will they continue to focus on making driving easier and faster? Before the proposed targets were released, ClimatePlan submitted a detailed letter to the ARB, pointing out areas where there is room for improvement that the MPOs might not be taking advantage of. For example, some of the alternatives analyses they performed didn’t seriously consider large investments in public transit or active transportation, or the transformative potential of those kinds of projects. Nor did they consider the potential of shifting funding from highways to other forms of transportation. In its letter, Climate Plan also noted that there is no time to waste. Climate change is already happening, and there should be urgency about putting a brake on business as usual. But too many of the MPOs are still focused on concerns about congestion, and still believe that they can solve it by widening roads, instead of looking at real alternatives that can meet a whole range of goals as well as reduce greenhouse gas emissions. Seriously, has anyone even considered, I mean, really considered, who the MPOs in the different regions are? I am under the impression that in some regions such MPOs are city council members. Making little sense, meanwhile, is that regions like the San Joaquin Valley are charged with meeting air-quality standards and by failing to meet such standards, federal highway dollars ($2.5 billion-worth) are being withheld until such time that the standards are met, if they’re met. Instead of having such funds withheld, these funds ought to go towards building light rail systems for instance in places like Bakersfield, Fresno, Stockton where they could go far to reduce vehicle miles traveled and therefore the pollution in the air coupled to driving. Or, could it be that maybe, just maybe, that’s just too logical???? More ambitious greenhouse gas reduction targets are needed, but regional governments say they can't meet them without more aggressive changes--which they say they don't have the power to impose. The California Air Resources Board thinks that cap-and-trade is the best way to reach greenhouse gas emission reduction targets set by the state, and is formulating a plan to extend it beyond 2020. The Assembly Transportation Committee heard and passed along several bills this week.